Reality television has been around for some time now, but unscripted shows still have the ability to feature moments that are wild, compelling and totally unexpected. That’s exactly what happened recently, when the Animal Planet series River Monsters discovered a castaway on an unpopulated island. When they found the man, they promptly rescued him, gave him a ton of water and soon discovered the story of how he came to be a castaway. The River Monsters team was shooting on location near a remote set of islands near Australia when the camera crew spotted a cooler sitting out on some rocks. Soon a man emerged from a cave and began yelling to the crew about needing water, hopping into the ocean to get nearer the boat. When they reached the man, named Tremine, they learned a lot about how he came to be there. He had tried to walk back, got beaten by the sun, and made his way back to the beach. Meanwhile, he had suffered from sunstroke and was unable to go any further. He then spent that first night on the beach, and the next morning he tried again, but the sun had gotten to be too much for him, and at this point, he is now trapped. Obviously, Tremine wasn’t a castaway for so long that he had his own Wilson, but his experience sounds harrowing. The man was an accomplished fisherman and knew what he was doing when he left his boat, but the heat just overcame him. He said it only took 2-3 hours before things took a turn for the worse. By the time the crew arrived on the scene, he had been preparing to die. The River Monsters camera crew caught most of the exchange on camera, and if you’d like to see the big rescue, you can give it a watch, below. This isn't the first instance of a person on TV who has suffered from a life-threatening issue. During a recent episode of Survivor, a contestant had to be airlifted away from the set and left the series after showing signs of heatstroke. Clearly Tremine's situation was even more dire. 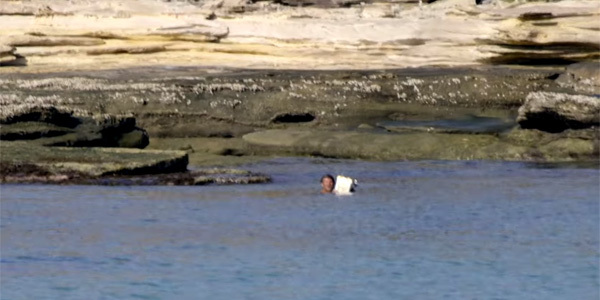 It was unlikely he expected to make his way onto television on the day he was rescued, but luckily for the Australian man, the camera crew was filming in the area and was able to save his life. New episodes of River Monsters air on Thursday nights at 10 p.m. ET on Animal Planet. In addition, you can check out what other shows are coming up this summer with our TV premiere schedule.